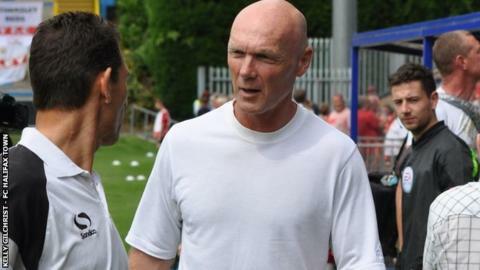 National League side FC Halifax have sacked manager Neil Aspin after just one win from their opening 10 games. Aspin, 50, took charge at The Shay in April 2009 and helped the club win promotion back to the top tier of non-league in 2013. He guided them to the play-offs in 2013-14 but ended last season with just one victory in 15 matches. After starting this campaign with one win from 10 games, the Shaymen are 23rd in the table. The club said in a statement: "The decision was sadly and reluctantly taken following a prolonged period of indifferent results stretching back to February 2015. "That said, the club wishes to place on record sincere thanks to Neil for his contribution to the club's great success over the last few seasons." Aspin led the team to three promotions in his time at the club and signed current England international Jamie Vardy from Stocksbridge Park Steels in 2010 before selling him to Fleetwood the following year.